The Spitfire is the iconic British aircraft of World War II. Its origins can be traced to the Schneider Trophy air races of 1930's where it was conceived as the Supermarine S.6B . This successful racing aircraft was the basis for the development of the Type 300 experimental fighter which flew for the first time on 5th March 1936. The Type 300 entered service with No 19 Squadron at Duxford on 4 August 1938. The Spitfire earned recognition from the outset and gained its immortality in the Battle of Britain, the first tactical defeat of the Nazi war machine in the English summer of 1940. Continual development throughout World War II enabled the Spitfire to maintain its superiority during this conflict. The Spitfire was eventually eclipsed by the development of jet aircraft post the War. Nonetheless it remained in service with various states world wide the last frontline service with the Burmese Air force in the late 1950's. ZK WDQ (civilian registration) or MH 367 (Royal Air Force designation) was constructed in its original form at the Castle Bromwich factory in July 1943. It was a Mark IX with a Merlin 61 engine. The aircraft saw Wartime Service initially with No 65 Squadron RAF with a first operational sortie on 15 Aug 1943. Its last combat sortie was on 18 April 1945. MH 367 was scrapped in 1948 to be rebuilt in the USA using components of several aircraft to fly again in November 2006. The aircraft first flew in New Zealand in May 2008. 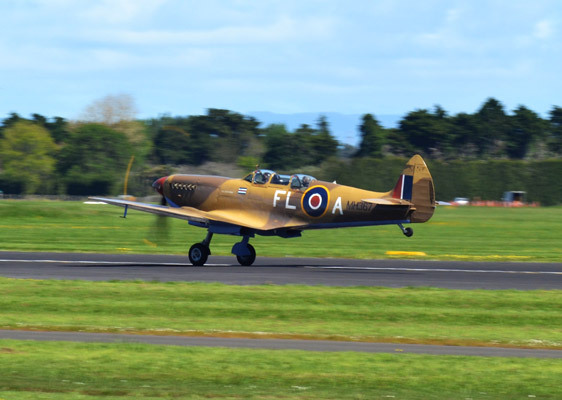 It is presented in the livery of Squadron leader Colin Gray, New Zealand's highest scoring WW II ace. WDQ is one of a few genuine two seat Spitfire's worldwide and Warbird Adventure Rides is proud to offer rides in this iconic World War II aircraft. Put yourself in the pilot's seat and 'live' the experience of the 'The Few', those immortal fighter pilots of the Battle of Britain, and every European theatre of World War II thereafter . You can enjoy one of our standard flight routes, or we will tailor a flight profile to your requirements, either way, we guarantee an experience you will never forget.